I recently had a business trip that allowed me the opportunity to visit my son at college. 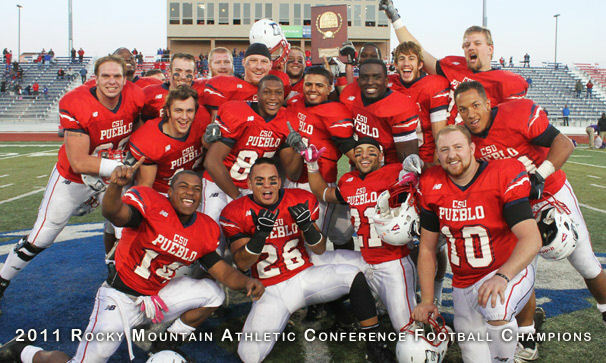 He is a freshman at Colorado State University-Pueblo and is playing football for them. They are a Division II football program that went undefeated last season and were ranked #1 in the nation for Division II schools at the end of the season. Pretty good, huh?! Although that is pretty impressive, what impresses me even more is the coaching staff—the leaders at the top of the football program. I went to visit Head Coach John Wristen to drop off a couple of Ken Blanchard’s books that I thought he would enjoy, and ended up spending 45 minutes chatting with him about his philosophy as a coach and what he is trying to teach these young men. In addition to running a top-notch football program, just as important to Coach Wristen is preparing these guys for life and real world circumstances that they will encounter. He is very clear about the importance of having clear goals and re-evaluating the goals often to make sure they are on track. He also wants the players to know what the values are of the program, since he strongly believes that values guide the specific behaviors he is looking for from his players. His job, he says, as the Head Coach is to be very clear in sharing his goals and values, and then making sure that he and his staff do everything they can to help the players be successful throughout the year. 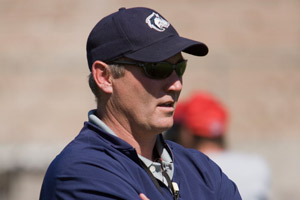 He and his fellow coaches truly care about the development of these young men–not only their abilities on the field–but off the field as well. He says that he thinks of each player as his son and he treats them in the way that he would want a coach to treat his own son. Needless to say, as a parent of a player, this warmed my heart and confirmed in my mind my son’s decision to come and play for this coach. I know that he is in good hands. I believe all leaders in organizations can learn a lesson from Coach Wristen. Let your team members know you care about them by being clear on what the goals are, what specific behaviors are expected from them, and what are your values that will help guide those behaviors. Remember, your direct reports, just like the football players, are part of YOUR team and you, as their leader, are only as effective as the rest of the team is. Thanks, Coach Wristen for being a great servant leader to your team! Now it is up to YOU to be a great coach to YOUR team! Maybe you, too, can take “your game” to the next level like Coach Wristen did this past season. P.S. Coach Wristen was named the National Coach of the Year by American Football Monthly magazine, a leading publication for football coaches. March 12, 2012 in Best Practices, Coaching, Leading, Servant Leadership, Talent Management, Uncategorized. Warms my heart too : ) Thank you for sharing your story! An inspiring post, Kathy. There’s much to be learned about leadership from good coaches. And it’s wonderful that your son has the opportunity to learn this first hand. Thanks for sharing your story with the rest of us. Football coaches are a diffeent breed who truly understand the art of management, know when to pull, when to push, and when to turn it up. The coaching mind truly understands who to develop people and maximize there inner potential. It was a pleasure to come across this article today, just a day after an executive resigned from Goldman Sachs, highlighting a corporate culture with a values problem. If Goldman had adopted the Wristen mentality in dealing with their clients, and then communicating that clearly to their employees, they wouldn’t be in the trouble they’re in now. Corporate culture matters!